Add drained rice and saute for 4-5 minutes in a medium flame. Add boiled water and salt, cover and cook till rice is done. In a bowl, marinate cleaned prawns with 1 tsp chilli powder, 1/2 tsp turmeric powder and salt. Heat oil in a pan and fry it and keep it aside. In another bowl, add sliced cauliflower, 1 tsp chilli powder, 1/2 tsp turmeric powder and salt and mix well. Fry it in the same oil (used for frying prawns) till done and keep it aside. Heat a thick bottomed pan, add little oil ( used for frying) and add sliced onions and saute till transparent. Add ginger-garlic paste and crushed green chillies and saute well. Add chopped tomatoes, salt, mint leaves, coriander leaves and mix well. Then add fried prawns and cauliflowers and mix well. Add cooked rice on top of the prepared prawns- cauliflower masala. 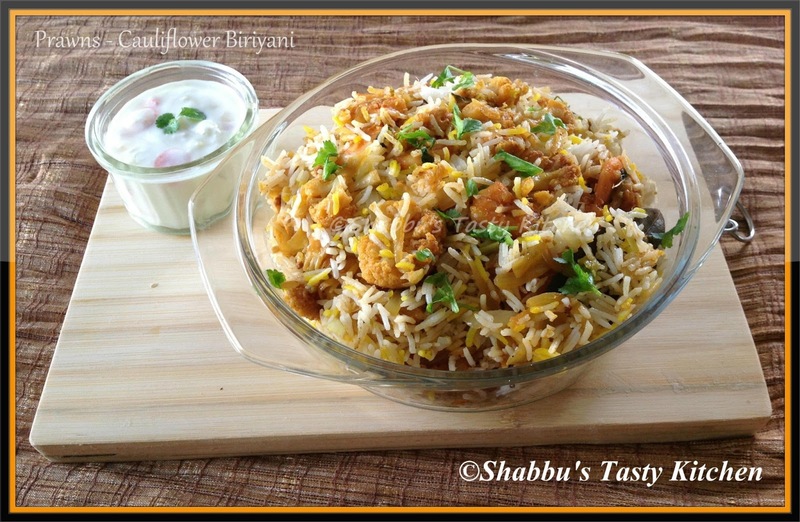 So tempting and delicious biryani! Wonderfully done,who can resist to this beautiful briyani.